In a recent interview, Chew Men Leong, Chief Executive of Singapore’s national water agency, the Public Utilities Board (PUB), announced that Singapore is on target to independently meet its water requirements even though its century-long supply contract with Malaysia is set to expire in 2061. 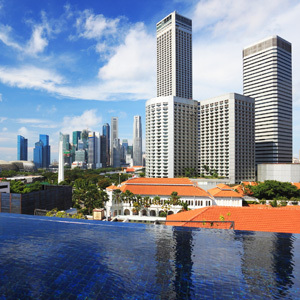 Speaking with Bloomberg News, the CEO of PUB expounded on the city-state’s sustainable water agenda, stating that Singapore has overcome its persistent water shortages despite its lack of natural water resources. Through aggressive efforts from the national water agency, desalination and recycling plants now produce 40% of the 456 million gallons (or 380 million in British gallons) used by its 5.2 million population daily. The Marina Barrage, a dam constructed in 2010 to hold water from Singapore River and Marina Bay, adds another 10%. The rest are sourced from Singapore’s reservoirs, which draw water through a 7,000 km drainage network, and imports from Malaysia. Rikvin, a Singapore company registration specialist, applauds the success of PUB’s sustainable water management program. Historically, Singapore has been dependent on its neighbor, Malaysia, for its water needs. With self-sufficiency as the ultimate goal, the country’s national water agency invested between S$600 million to S$800 million annually since 2006 on new technologies to increase its supply. The PUB’s aggressive efforts have created a bustling industry that has attracted the likes of General Electric Co and Siemens AG (SIE), and put local water companies like Hyflux Ltd (HYF) on the map. “Thanks to the PUB’s aggressive sustainable water management program, water R&D now has a bullish presence in the Singapore economy, and self-sufficiency in terms of water supply is almost a tangible reality,” Rikvin’s Mr. Bakhda concluded.